The Huang family is without an heir… In early to mid 19th century China, this has grave consequences for the old traditions. Purple Jade has the humility, dignity, and pragmatism to bring an heir to the Huangs in any culturally justified means available: a Concubine for the Family. The violence in this book was softened. The cultural shock was softened. The bad guy was ambiguous. 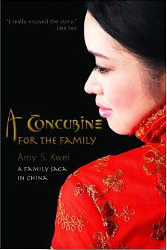 Amy Kwei chose to soften the blow of the violence in this book by using a mellowing narrative voice. I thought it was fitting for the author to soften her words and perspective (softening the truth perhaps), because the characters and persons in the book showed considerable restraint. Where you or I would lash out in voice or action, Purple Jade held her peace and showed that she was considering both sides to a situation (in her thoughts). The author describes this as a concept of fixing yourself before fixing the world: “By cultivating oneself, we can regulate the family; by regulating the family, we can govern the state; by governing the state, we can bring peace on earth. When order and kindness direct the world, heaven will be pleased.” (Page 326). What a wonderful concept that everyone should adopt, at least in part, and the world would be a better place. Perhaps the bad guy was not a single person, but actions of people or actions of a country. Perhaps it is fate or old traditions. Perhaps it is the concept of war. Kwei gives the reader much to ponder by not handing us a simple and easy character to despise and blame. The characters are just as much prone to their fate as we are in real life. I get a little lost in the politics of a country’s history I know nothing about and a country’s culture I am quite unfamiliar with, but that’s what makes this book so fascinating. Kwei describes the proper way to eat and what is proper to eat. She describes when and who speaks, political gains and favors, and the halting way of speaking (as if it’s been translated just for our eyes). I am peeking into a world I would normally not have insight into and it is described in enough detail to give me a taste without having overwhelming flavor. I very much enjoyed Kwei’s descriptions of cultural traditions and the differences between modern living and traditions of the past. The concept of “saving face” was intriguing, as was the struggle between culture and shame. “If we can agree with their concept that each person is endowed with thoughts and feelings worthy of singular attention, more opportunities and developments would surely follow.” (Page 298). I recommend this book for anyone who enjoys historical fiction with a political element, culturally rich stories, novels featuring Chinese in China, or a novel with a strong female lead. This novel was published by Tats Publishing August 2, 2012 and is available on Amazon here.